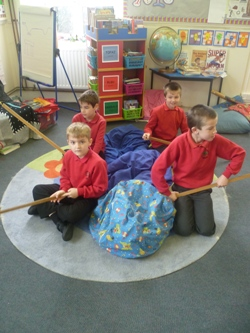 Throughout this half term Class 2 have been taking part in Wild Tribe sessions every Thursday afternoon. 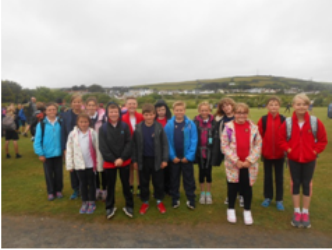 They have had great fun learning to do orienteering, artwork and maths outside – A huge thank you to Jenny Guy for coming out to us. 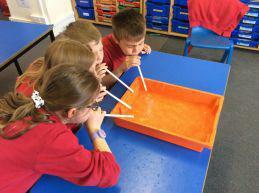 In science we have learnt about sound and pitch; making our own straw pan pipes from recycled straws. 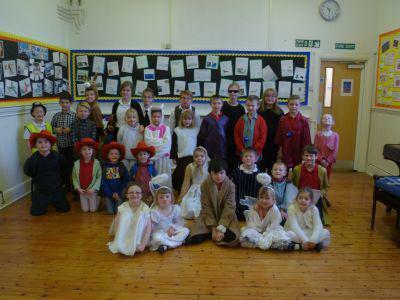 On Thursday 7th March we celebrated World Book Day, during the week the children took part in a sponsored read at home as well as an extreme reading challenge they also had the opportunity to share their books with the other children in the school. In topic we have almost come to the end of our Shang Dynasty block. 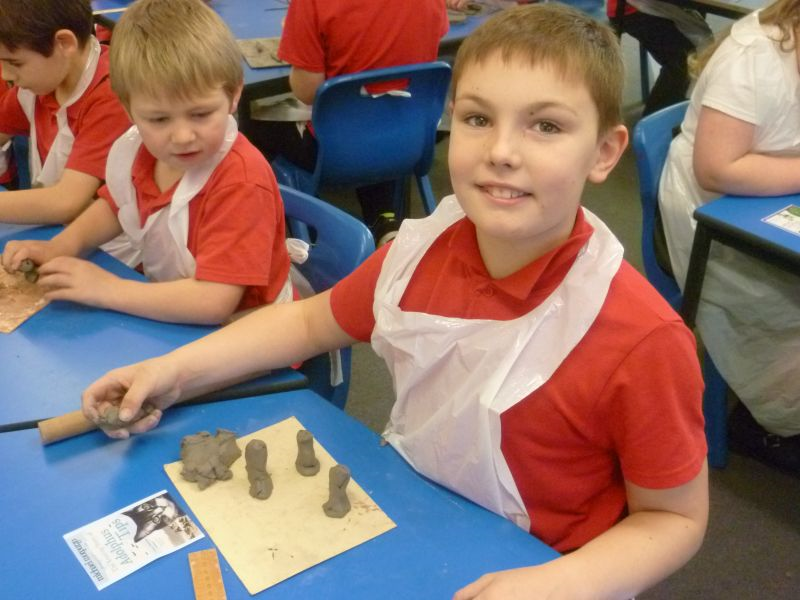 We have learnt about Chinese new year, looked at the legends and myths of dragons and had great fun making oracle bones out of clay – these will be fired over the holidays. On Friday 25th January Class 2 travelled to Kingsley School in Bideford to take part in a Judo Skills day. 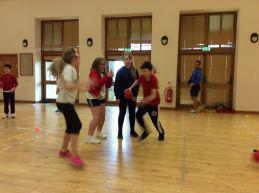 The children were all incredibly well behaved and had a fantastic time learning how to throw each other! In English we have started looking at our new book; Cloud Busting. This is a book made up of poems which combined, tell a story of three boys. We have enjoyed reading the poems, discussing what we liked or didn’t like as well as spotting patterns in the different forms of poetry used. 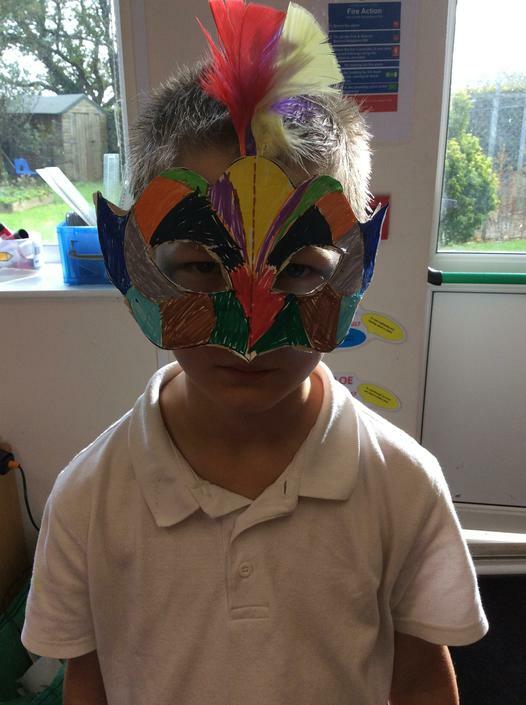 In PE the children have been listening to music and creating dances from the past, present and future which included dance inspired by WW1, portraying Greek gods and goddesses and making a Viking boat. In Maths we are still on our Geometric Reasoning block. We have spent lots of time ensuring we have a secure understanding of 2D and 3D shapes, as well as understanding the different types of angles. The older children have become more confident using protractors and Year 6 have been learning how to draw shapes using specific lengths and angles. oil pastels and chalk pastels. We are continuing with our English book; ‘How Stuff Works’. We’ve been learning about torches and will be writing a fact page about this. In topic we have been looking at designs of buildings and architecture. We have looked at the work of Gaudi and recreated our own mosaics. These are on display in the classroom. 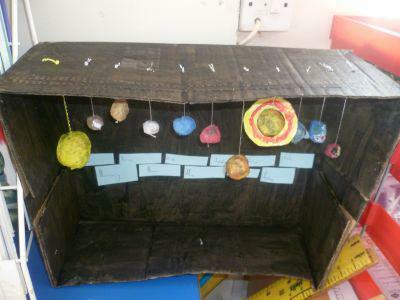 I was amazed to see the quality of the children’s homework this week. I can see they have worked incredibly hard at home to make their various buildings. 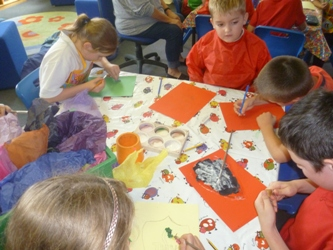 In English we have begun writing our Innovate Story – Arthur and the Golden Paintbrush. At this stage of the sequence we came up with an idea as a class with a shared structure before writing independently. Once completed everyone will write their own quest story. 100 years of WW1 and to honour the memory of the fallen and the future of the living. We have been continuing with science and have learnt about what our bodies need to grow, all about our skeletal system, the growth of humans throughout their lives and much more. It has all been very interesting, and we now have lots of skeletons hanging around Class Two! In Topic we have moved onto Science. 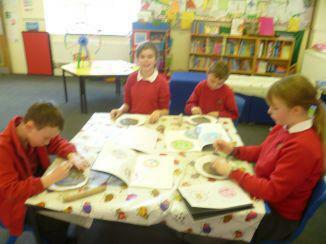 The children have been learning about microorganisms and bacteria. 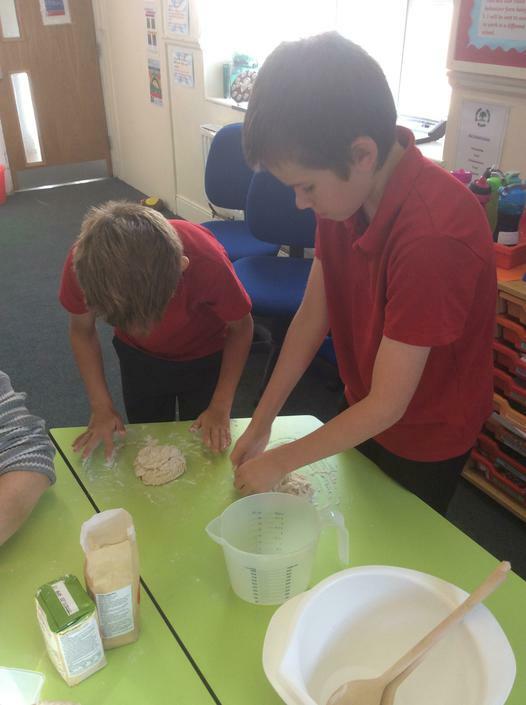 They have been carrying out investigations to see how the rate of mould grows on a piece of bread in different situations. We have now come to the end of our World War Two topic; the children have had a fantastic time learning all about the war as well as life in Britain in a very different time to now. This was ended by Class Two making their own Anderson Shelters just before half term. I was so impressed with how well they all worked together to design and make their Anderson shelters with no adult support at all, the only instruction they had from me, was here’s the cardboard, off you go! In English we are writing our final piece. 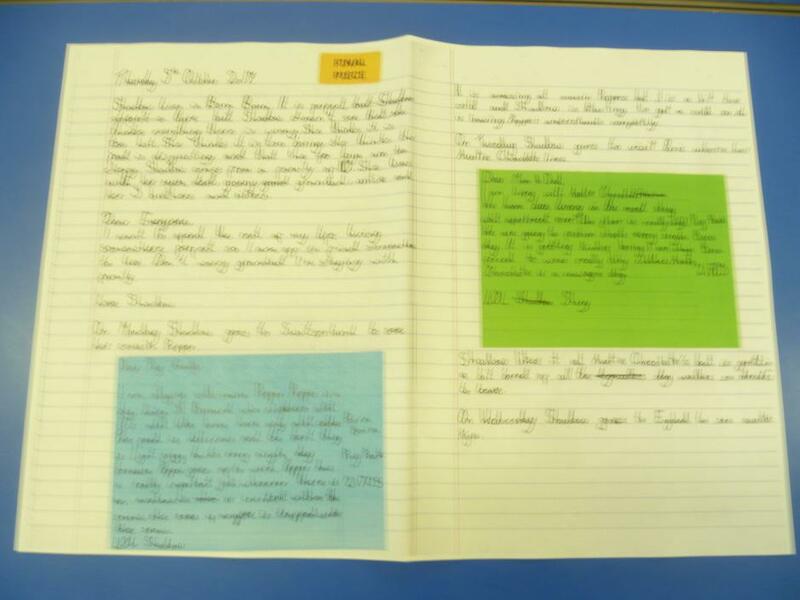 We are writing a diary during WW2 from the perspective of a young boy living in London who is evacuated to Bradford. We’ve really enjoyed writing about the war, using our knowledge from topic to help us. We are having great fun looking at WW2. We have looked at evacuation, the home front as well as creating our own propaganda posters after looking at those during the war. 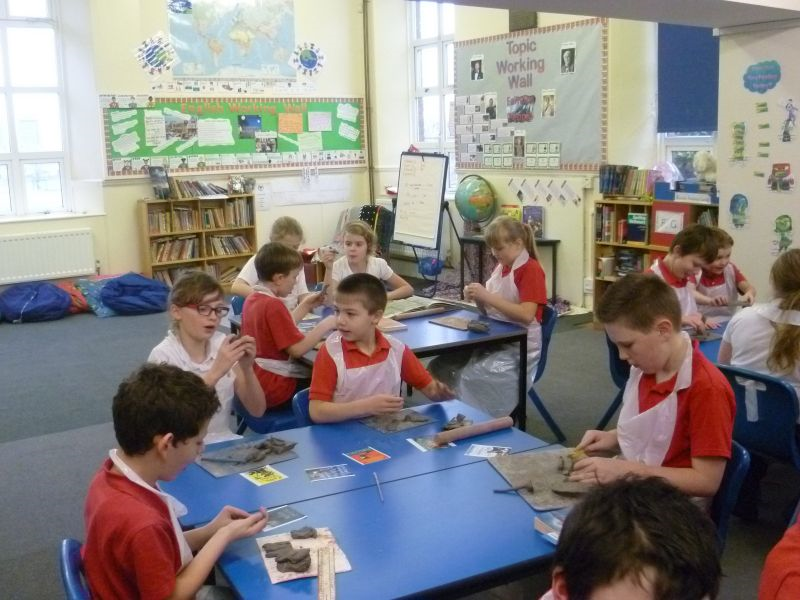 Last week Class Two were very lucky to go on a trip to Cobbaton Combat Museum. We had a fantastic day looking at the memorabilia as well as having the opportunity to go in an Anderson shelter and try on a soldier’s uniform and gas mask. In topic we have started our new focus, WW2. The children are all incredibly excited to find out more and have already found out who the war involved, important dates and people as well as evacuation, with some writing lessons as an evacuee. 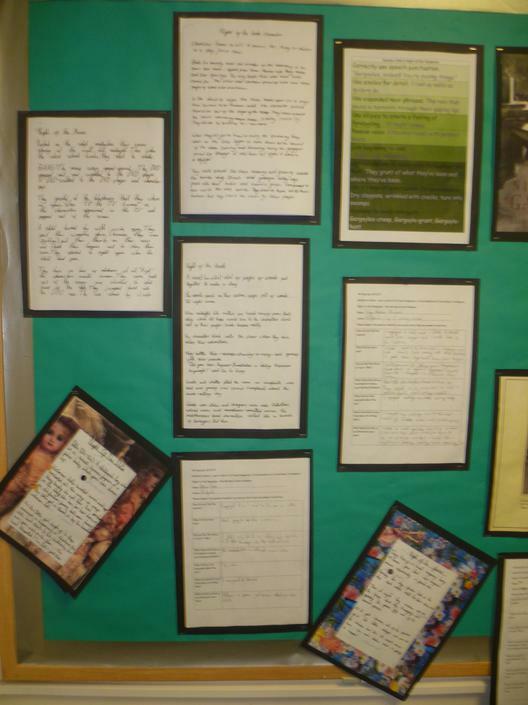 We have written our own poetry based on artwork, which is on display, please have a look if you have chance. We are using the last bit of time before Easter to look further at poetry and the different types of poetry including acrostic, shape, rhyming, non-sense and more. We’ll be writing some more of our own poetry soon and putting these on display on our writing wall. We have started our Wild Tribe sessions which is focusing on maths, we have looked at classifying trees and using this information to create bar and pie charts as well as finding the perimeter of leaves! We are also learning lots of fantastic information about the wild; we’ve had a go at bark rubbings, making wood necklaces and much more. In English Class Two are now writing their own hybrid texts based on a day in a woodland. We have researched how the setting might change throughout the day including which animals may appear! These are on display in our classroom; we’d love to show you so please pop in at the start of the day if you want to have a look. In Topic we are continuing to learn about the Egyptians! We have learnt about Tutankhamun, hieroglyphics, the importance of the river Nile and the children’s favourite, mummification! We had a brilliant afternoon learning how the Egyptians would mummify their Pharaoh’s, mummifying each other using toilet roll and mummifying an apple! We have been checking these and found it very interesting to see what has happened! 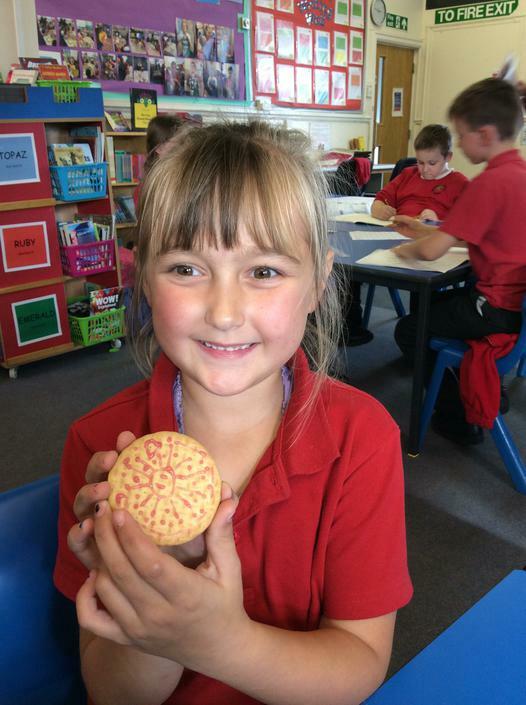 I’ve also been hearing about some fantastic ideas for their Egyptian homework – to create an Egyptian artefact – we’ve already eaten a lemon sponge pyramid and I can’t wait to see the rest! 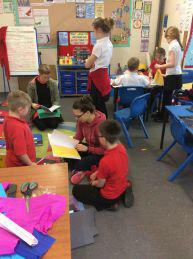 Last week the year 6 Children took part in a Federation Writing Day. 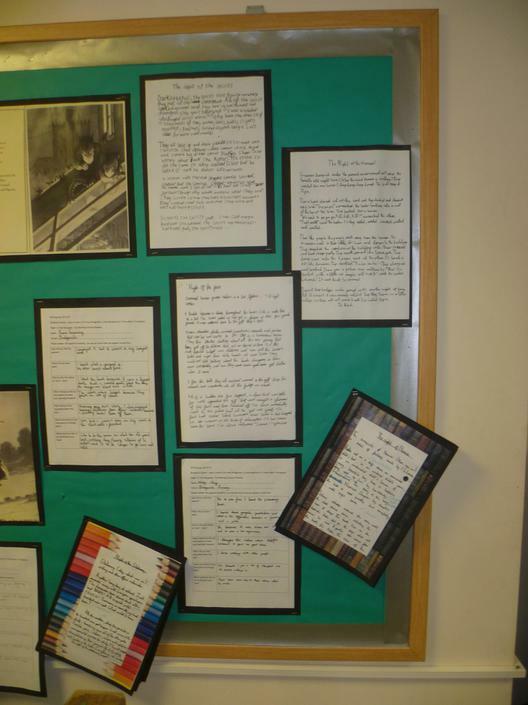 The Year 6’s from Black Torrington and Bridgerule came over for the day and produced some fantastic writing. 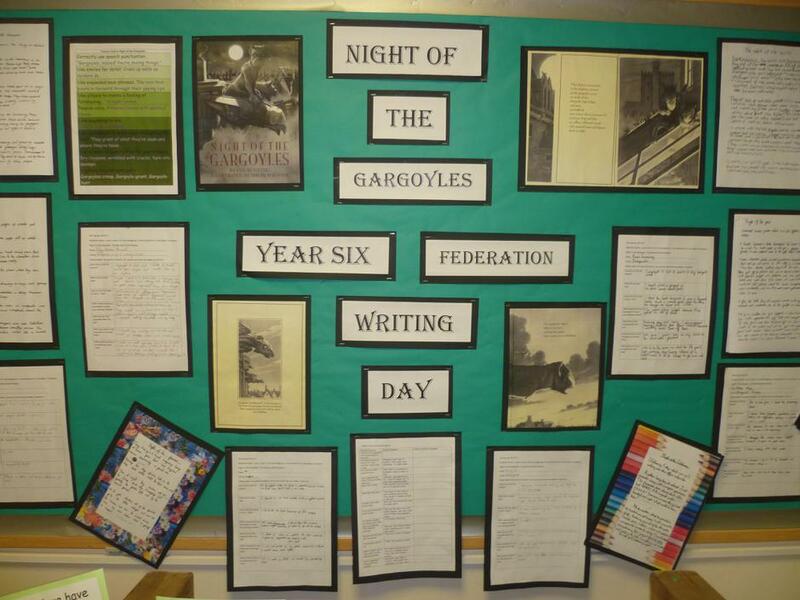 We looked at a book called ‘Night of the Gargoyles’ before writing out own ‘Night of the …’ These are on display in the school, please have a look – we are very proud of their hard work! 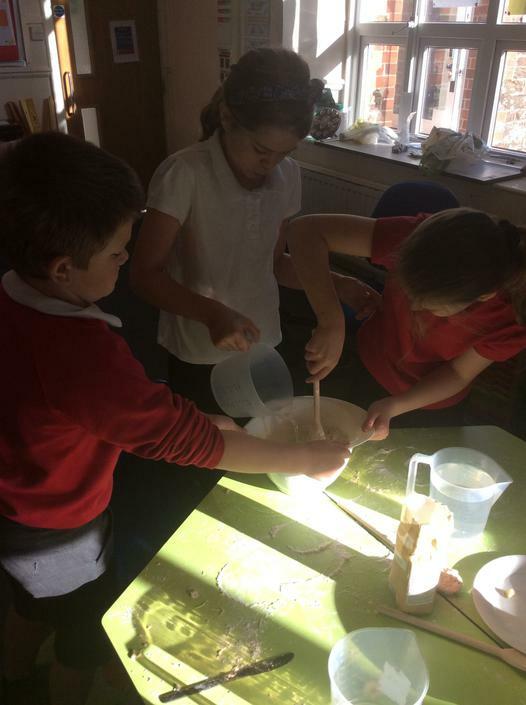 On Monday 6th November as part of their topic work the children in Class 2 had a fantastic time baking their own bread. They also brought in their own ingredients to add to the bread if they wished. 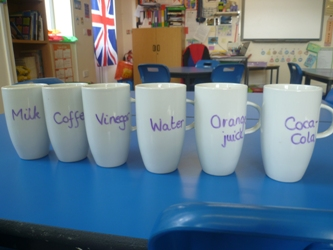 We hoped all the parents enjoyed tasting it at home as the smell in the school was amazing. 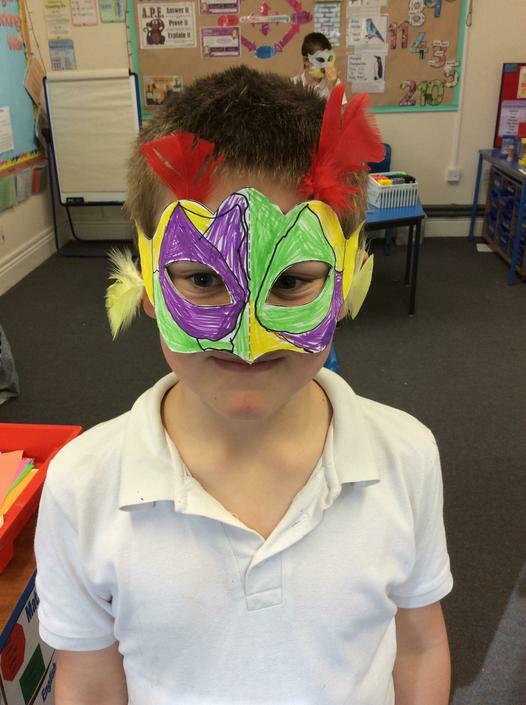 In topic Class two have learnt about Italy, comparing two European countries. 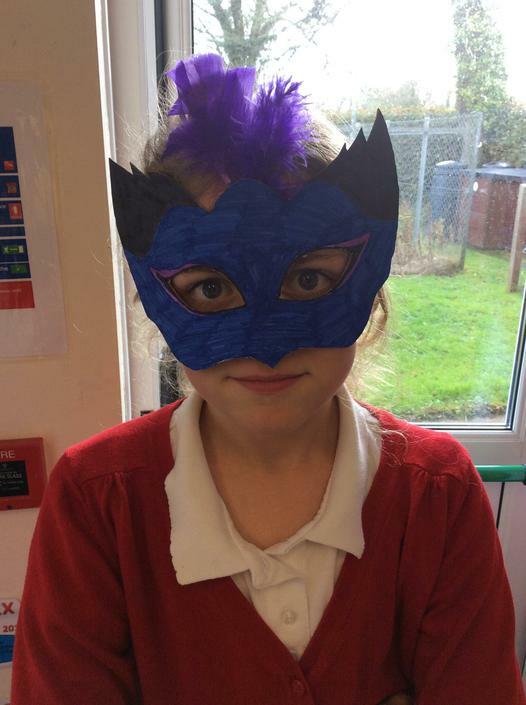 They also designed and made their own Venetian Masks. 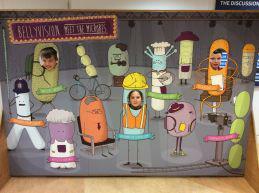 In topic we have continued looking around the world! We have compared our daily lives to those living in India as well as designing our own henna patterns which the children enjoyed recreating on biscuits with icing! In English we are about to write our final piece for ‘Meerkat Mail’. We have plotted our own version of the story which involves an animal visiting different places before realising no-where is quite as perfect as home! These are now on display in Class Two. Our new topic is ‘Our World’; the children would like to find out about our current world including food, art and technology. 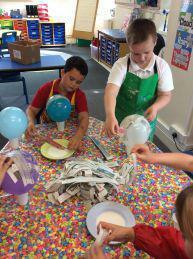 We have started by designing our own hot air balloons and have started making our Papier Mache hot air balloons to travel the world! 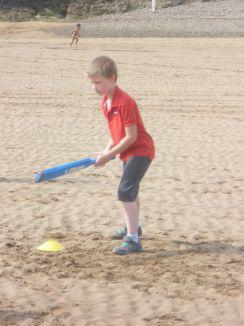 On Friday 7th July Class Two went on a trip to Summerleaze Beach Festival. They joined children from local schools and took part in various sporting activities including volleyball, football and cricket. The children all had lots of fun playing in the sand and eating their lunch before listening to a talk from a lifeguard about keeping safe on the beach. Again, we were all very impressed with how well they behaved throughout the morning. We have moved on slightly within our topic to the last part; Space! 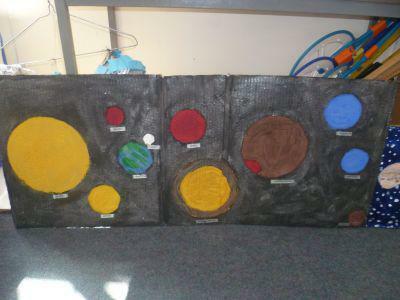 I was incredibly impressed to see all the fantastic solar systems the children brought it. We have looked at light sources, and why the moon is not a source of light! 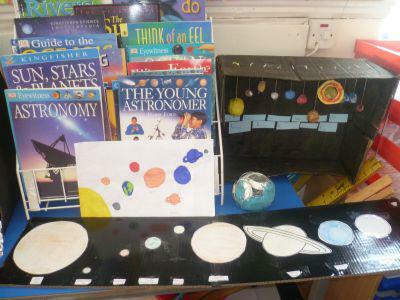 We have also looked at how we know the Earth is round, and not flat, as previously thought! 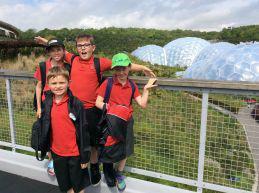 On Monday 22nd May Class Two went on a trip to the Eden Project. We had the opportunity to look around the Mediterranean dome in the morning before having a Chocology workshop in the afternoon involving various challenges in the rainforest dome. The weather was beautiful all day and the children behaved really well. A big thank you to FOBs who kindly paid for the workshop. In Topic we have started our new topic; land, sea and space. We have looked at flooding including comparing the flood at Boscastle and Lynmouth as well as starting our own group projects in computing. The children are in small groups and each week will be adding to their project based on a topic of their choice within Land, Sea and Space. On Wednesday 15th March Class Two were lucky to have Mr Pugh visit from the college to take part in a special session of handball. 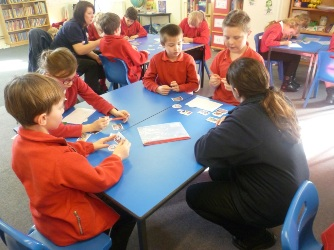 They enjoyed learning the rules of a new game and having the opportunity to play some mini games. 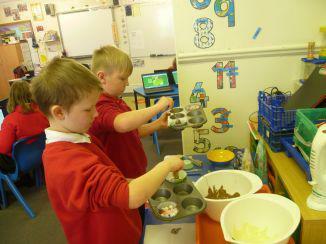 Last week the children enjoyed making their own chocolate bars based on our Aztec topic. 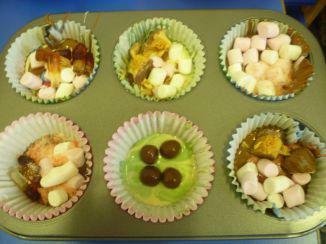 There were some very different ideas and they enjoyed eating their creations! 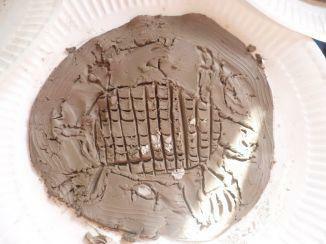 The class have also enjoyed using clay with Mrs Southam, using the coil technique to create an Aztec inspired plate. where they came from as well as their lifestyles. We have also found out more about the different classes of society. 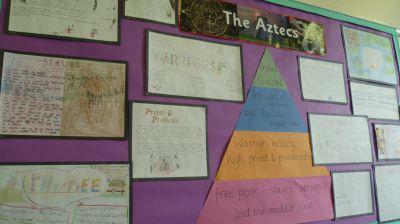 We will soon begin looking at Aztecs and Chocolate! Class Two are very excited about this part of our Topic! 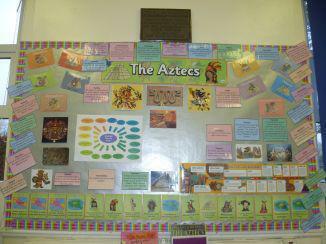 In topic we have begun our new focus - The Aztecs! We have enjoyed beginning to find out where the Aztecs came from as well as trying to work out how to pronounce some of the very long, complicated names! Children in both Class 1 and 2 have been working exceptionally hard on the Nativity over the past few weeks, learning their lines and songs as well as where they should be at each point! We are all very excited to show you next week. own version of the story. The class decided to write their own version where the magical place is full of all their ‘Wants and Wishes’. Once completed, we will move onto writing independently about our own magical places. Throughout this we have looked at expanded noun phrases, adverbs and using speech as well as how we can engage the reader for the purpose of the story. 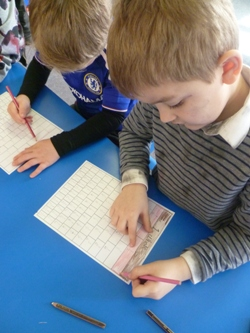 Over the past few weeks Class Two have continued with their multiplicative reasoning sequence. We have looked at how division is the opposite to multiplication and we have looked at what resources can help us with our multiplication and division. Some of the class have also looked at how we can use written methods to help solve very tricky problems using the grid method for multiplication and the bus stop method for division. 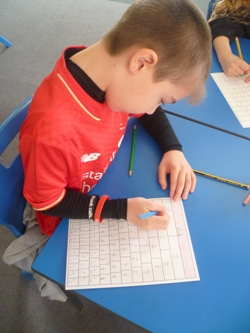 Class Two have continued with the additive reasoning sequence in maths. We have looked at various methods to solve addition and subtraction questions including word problems. We have improved our abilities to explain and reason our answers as well as understanding the difference processes. 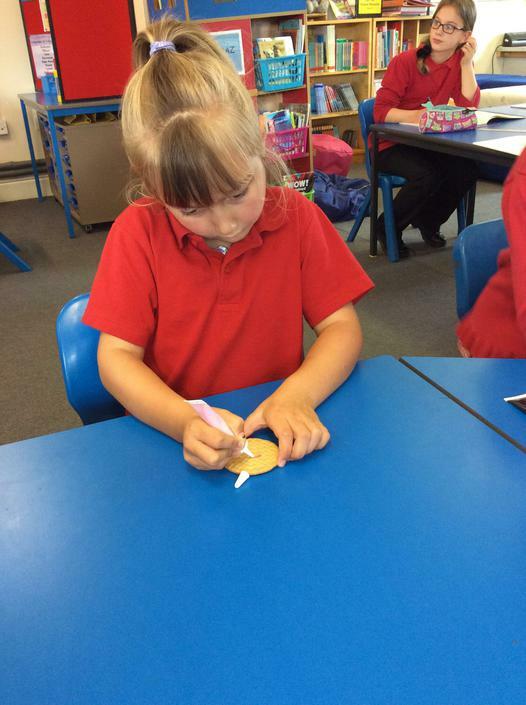 In topic we have really enjoyed making our own wands and this week had a go at making our own magic tricks! 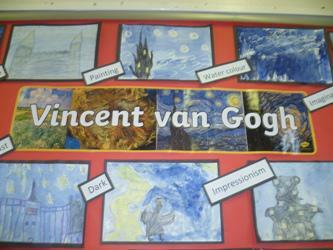 We also made some fantastic art work based on ‘Starry Night’ by Van Gogh. 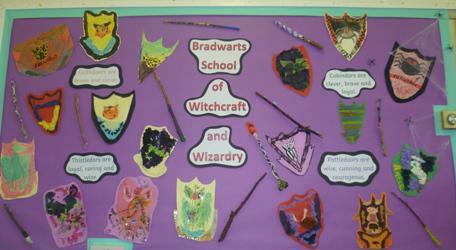 These are on display in the classroom and showed our ideas for what our magical school ‘Bradwarts’ might look like. In topic we have looked at how people enter magical places and made our train tickets to Hogwarts. We’ve also created our own house logos for ‘Bradwarts School of Witchcraft and Wizardry’ and have begun to make our own magic wands. 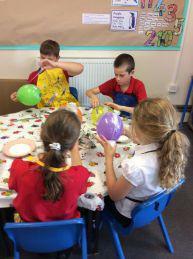 On Thursday 7th July Class 2 went to the Milky Way for the day. 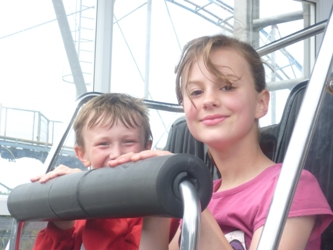 We had a fantastic time playing on the dodgems, indoor area, roller coasters and more. We watched a show about space and the galaxy and got a little bit lost in the maze! 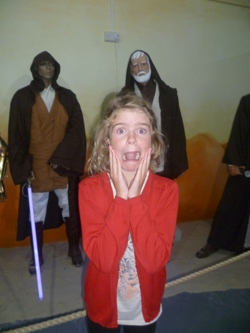 Miss Southam was very impressed with the behaviour of all the children. 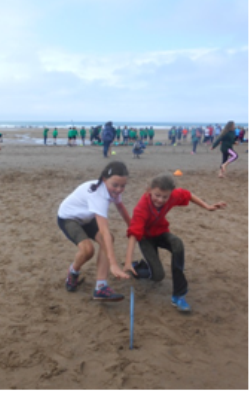 On Friday 17th June the Year 5 and 6 children enjoyed a lovely day out at OceanFest with children from Black Torrington Primary School. 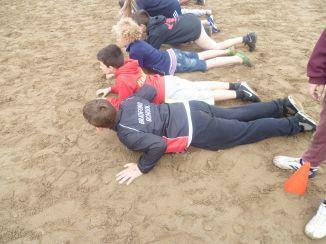 They enjoyed activities including code breaking, beach flag and Zumba. They also enjoyed the inflatable challenge as an extra activity! 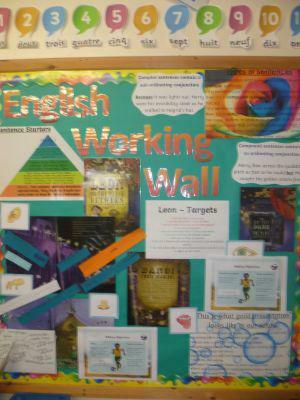 In topic we have continued our Olympic topic and have begun to focus on Rio de Janeiro. We have learnt more about Brazil, its place in the world and its climate as well as what life is like to live in Brazil. We have also looked at the rainforest. 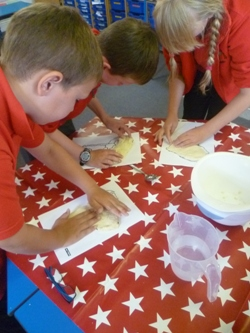 Class 2 particularly enjoyed making their own salt dough and making their own model of South America. Once dry we will be painting and labelling these with the different countries in South America. In their Science lesson this week the year 3 and 4’s have looked at the digestive system and we have also looked at teeth and how we can look after them. 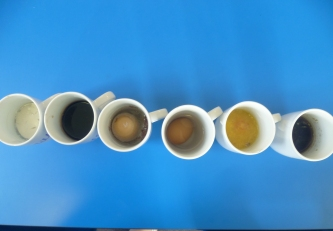 We have enjoyed turning this into an experiment by putting hard boiled eggs into a variety of liquids which we will look at again next week to see if there has been any changes. In topic we have continued to look at the Olympics. We have learnt about the Ancient Olympics and how the modern Olympics started. 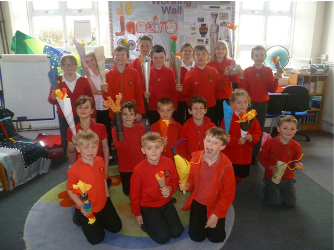 We have also designed and made our own Olympic torches which are on display in the classroom. We are currently on a geometric sequence and have been looking at graphs and coordinates as well as angles in shapes.The year 3’s enjoyed using the beebots to show their understanding of angles and turns and the year 4 and 5’s had a great time playing battleships to practise their co-ordinates! 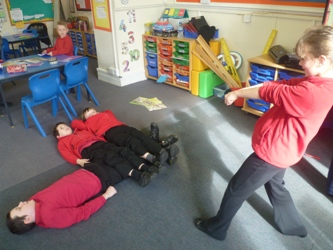 In English we are currently looking at a book called ‘The Secrets of Stonehenge’.We have enjoyed finding out the myths and facts about how Stonehenge was built and have used this as an opportunity to use drama, creating freeze frames of scenes in the book. We have also looked at the sentence structure and content in a non-fiction before we work on making our own about a different place of historical importance. In science we have explored lots of different areas of physics. We have looked at light and sound, electricity and space! 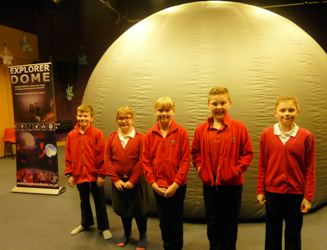 Years 5 and 6 have also visited the Explorer Dome and learned about the body. 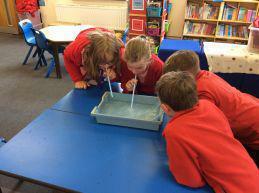 Class 2 have enjoyed being able to use experiments to help with their understanding. 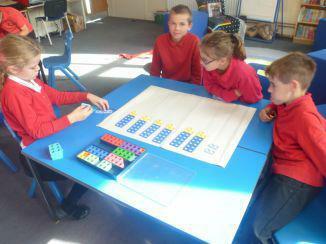 In Maths we are currently on a number sense sequence that primarily looks at fractions, decimals and percentages. 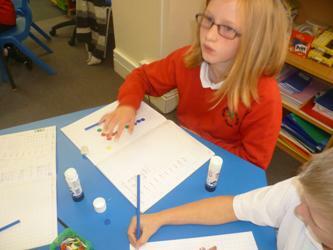 Class 2 have enjoyed looking at equivalent fractions and adding and subtracting them. 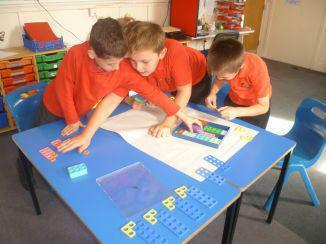 They have also made their own fraction walls to deepen their understanding. 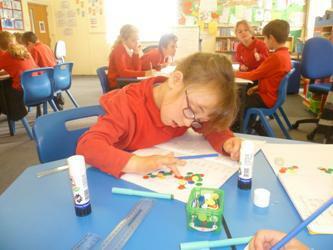 Over the past 2 weeks Class 2 has been working extremely hard, particularly on their writing. We have now come to an end of our ‘Mirror’ sequence which has concluding in writing their story based on ‘A day in the life of a Moroccan Boy’. These are now on display in the library. 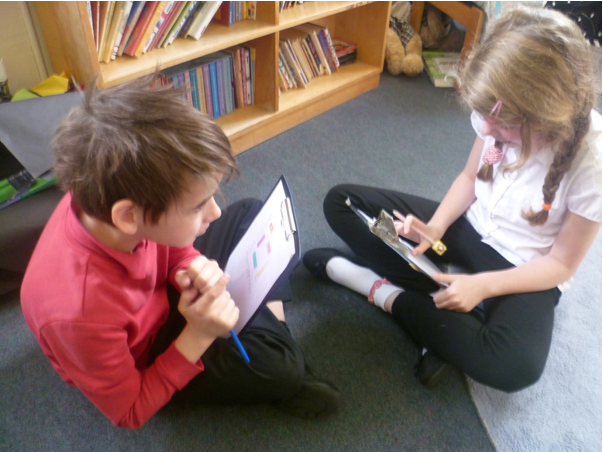 The children have also been busy writing up their ideas for the BBC 500 words competition. 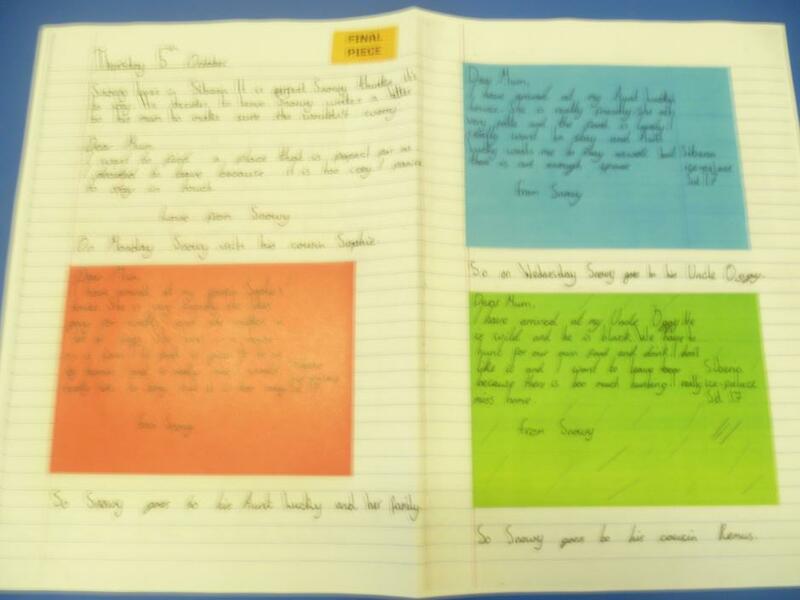 There has been some fantastic writing going on! This week we also had a visit from Devon and Cornwall Fire Service. 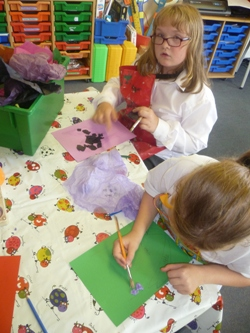 We learnt what hazards there may be in our homes and learnt about what we should do if there is a fire either at home, school or in a public place. In English we are looking at two different books, ‘Mirror’ and ‘The Day of Ahmed’s Secret’. 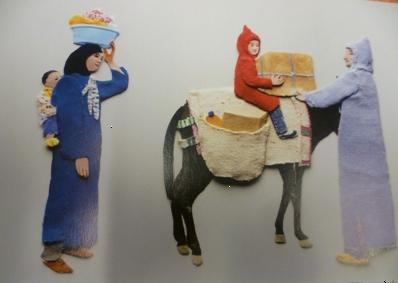 The children have enjoyed looking at the life of a child from a different part of the world and exploring how the writer draws the reader in through their choice of language. Our topic this term is ‘Famous People’. 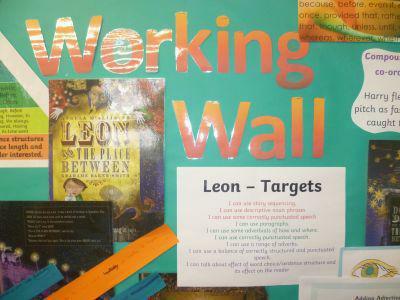 We will be looking at a new famous person each week including Henry VIII, Queen Elizabeth II and Michael Morpurgo. 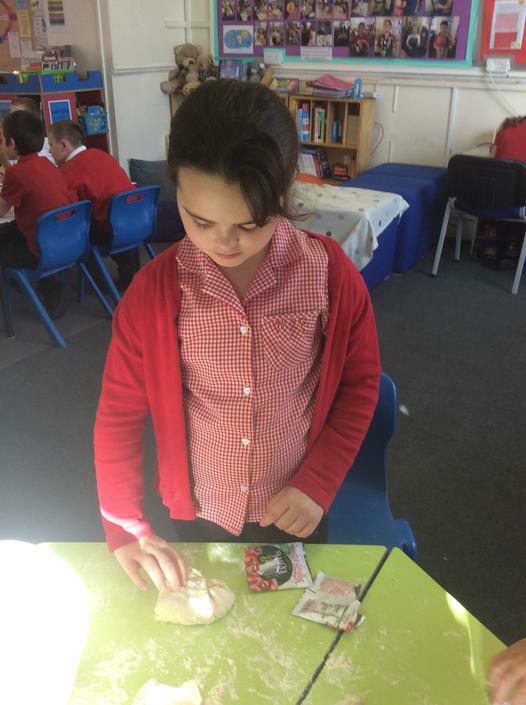 We have had the opportunity to create posters and fact sheets as well as doing some painting, drawing and making models of Michael Morpurgo characters out of clay. Over the following weeks we will be looking at David Beckham and Thomas Edison.